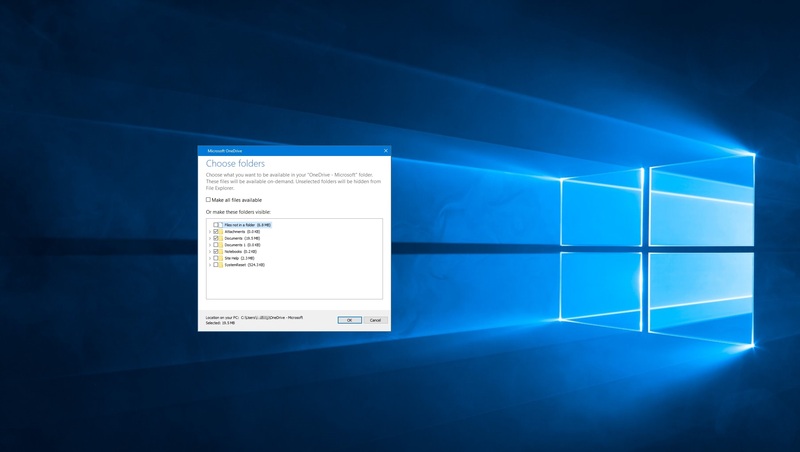 Among the tools that come with your Windows device, OneDrive might be among the more valuable. Yes, it’s a storage service, which means any photos, documents, videos, music or any other type of file can be saved to OneDrive, just as you’d save them to your device. But OneDrive’s usefulness goes farther than that. And once you’ve explored what you can do with OneDrive, I think you’ll find it useful daily, more than just occasionally. OneDrive, which has been around since 2008, is a free service available to anyone with a Microsoft account (the same account you use for Outlook, Xbox, Skype or other Microsoft services). It’s simplest to look at OneDrive as 5 GB of free, secure storage – meaning you can save thousands of pictures, videos, songs and documents in OneDrive. It appears in Windows 10 as a built-in app – type “OneDrive” into the Windows search box and you’ll find it. This app, which looks and works a lot like File Explorer, is one way to work with OneDrive and what you store there. To use the technical term, OneDrive is a “cloud service”, which just means that what it does takes place online. 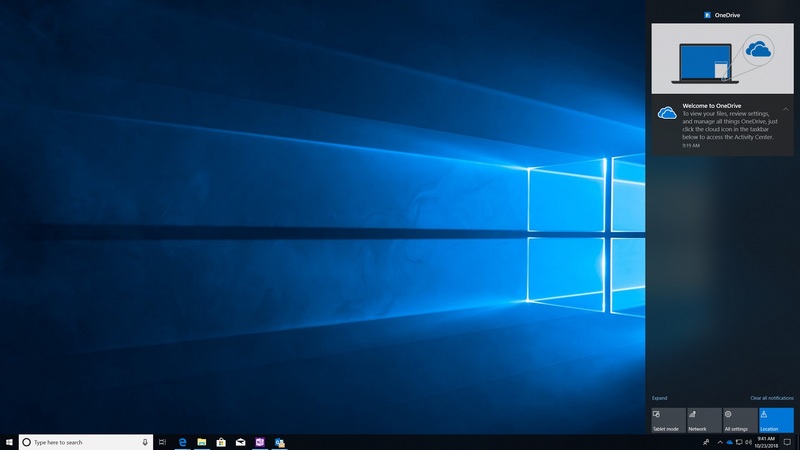 That includes saving or backing up your files, sharing and editing them, and synchronizing information between Windows, Office, Xbox, or other Microsoft services you might use. Let’s do the very simple setup, then look at some ways you can put OneDrive to work for you. Set where to store the OneDrive files that you’re also keeping on your device. In most cases, you can just click Next here to accept Windows’ suggestion. If you have a device with very limited hard drive storage space, you can pick an alternate location, such as a memory card or external hard drive. Choose which folders sync (short for "synchronize") between your device and OneDrive. This means you can have folders stored in OneDrive but quickly accessible on your device as well. Check the box to Make all files available, unless you want to conserve your device’s limited storage space. In that case, pick only the folders you want available on your device. That’s it! The folders you select will be “mirrored”, meaning you’ll find them in both OneDrive and your device. Any folders that were not selected can be found in OneDrive only, and won’t take up storage space on your device. When you open the OneDrive app on your device, or use File Explorer, you’ll see those folders available. Another way to make files and folders available on both OneDrive and your device, while using less of your device storage, is to use OneDrive Files On-Demand. OneDrive’s central function is as storage – think of it as another disk drive for your device. To take advantage of that storage, there are several ways to access and save files in OneDrive. 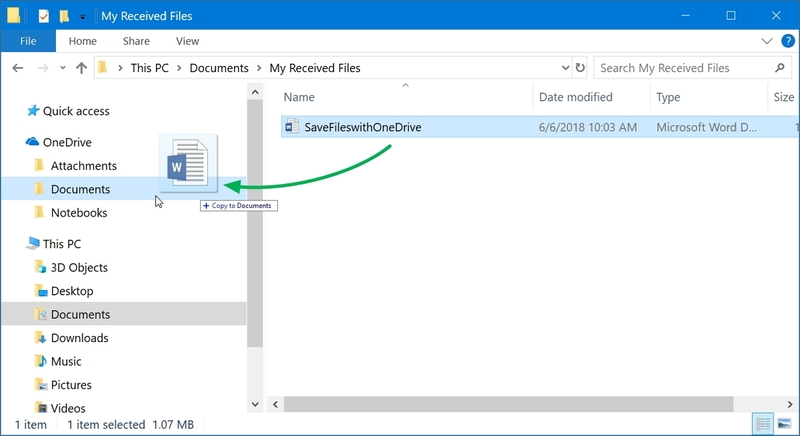 Save and Save as: If an app allows you to use “save” or “save as” to keep a file, OneDrive is available as a destination for the file. Such apps include Microsoft Office, Windows Mail, Paint 3D, Microsoft Edge, and many others. In the Save As box, find the OneDrive folder you want to save to. Move in the OneDrive app: The OneDrive app in Windows works just like File Explorer, which means you can move files or folders around directly. If you have a file on your device that isn’t synced or mirrored in OneDrive, you can drag it into the OneDrive folder. Drag files to move them out of OneDrive as well, or from one OneDrive folder to another. Remember you don’t normally need to move an individual file if the folder it’s in is synced to OneDrive. Open files: Files in OneDrive can be opened from the OneDrive app – just double-click and the file opens in the app in which it was created. 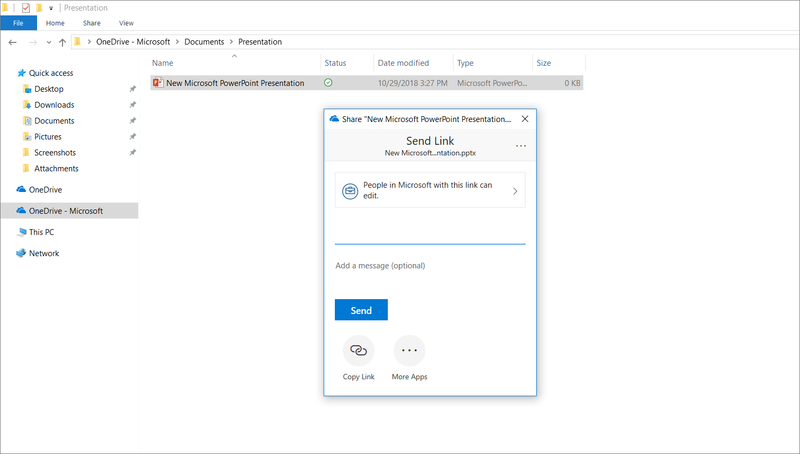 Also, if you’re working in an app – PowerPoint, for example – and go to Open a file, OneDrive appears as one of the sources of files to open. This means you can click a photo kept in OneDrive and it will open in the Windows Photos app, or you can play music saved on OneDrive with the Groove app. If you’re using the Mail app, you can attach files you keep in OneDrive to messages. Just like files in a regular disk drive! Share your files: One of the great parts about OneDrive as an online service is that you can share files, folders, photo albums, videos, or other files. People you share with get a link to the file on OneDrive, instead of email attachments. This is a great way to share photo albums, long videos, or file folders that would be hard, or impossible, to attach to an email. Plus, it is a very secure process – only the designated recipient (or recipients) of your link can access the shared file. Even if they forward the link, those people can’t access it unless you provide permission. This kind of security isn’t possible with email attachments. In the OneDrive app, find the file you want to share, right-click it and select Share. In the Send Link box that appears, you can click Copy Link, and paste the link into an email message, or type the recipient’s email address on the To line, add a message if you want, and send the link directly. As mentioned earlier, OneDrive is an online service. What does that mean for you? For one thing, it means you can access your OneDrive files from any device that connects to the internet. Using a web browser, go to www.onedrive.com and sign in with your Microsoft account. Even if you’re on the other side of the country from your computer, you can still access OneDrive and open, save, edit and share your files. It also means OneDrive can connect your computer with your phone or tablet. The OneDrive app is available for OSX, iOS, and Android, which allows access to your pictures, music, movies, and documents from mobile devices while you’re on the go. The app also lets you automatically save photos you take directly to OneDrive, so that you never have to worry about losing your pictures! Plus, files (including photos) you save from those devices to OneDrive are then available on your Windows device, including Xbox. Whether you’re looking for a solution to save precious photographed memories, or trying to find a way to free up storage on your hard drive, OneDrive can save you from a lot of headache.